My experience of these type of coffee cakes is that they don’t last long. Firstly, they taste good and get eaten quickly and secondly they dry out and can’t be kept more than a day or so. Not sure if there’s anything French about them, but I do know it’s the topping that makes them so good. This recipe comes from the back of a 1970s White Wings Plain Flour packet so you need to do some metric conversions. 1oz = 30ml, 2oz = 60ml and the pan size converts to a 15cm tin. Enjoy!! 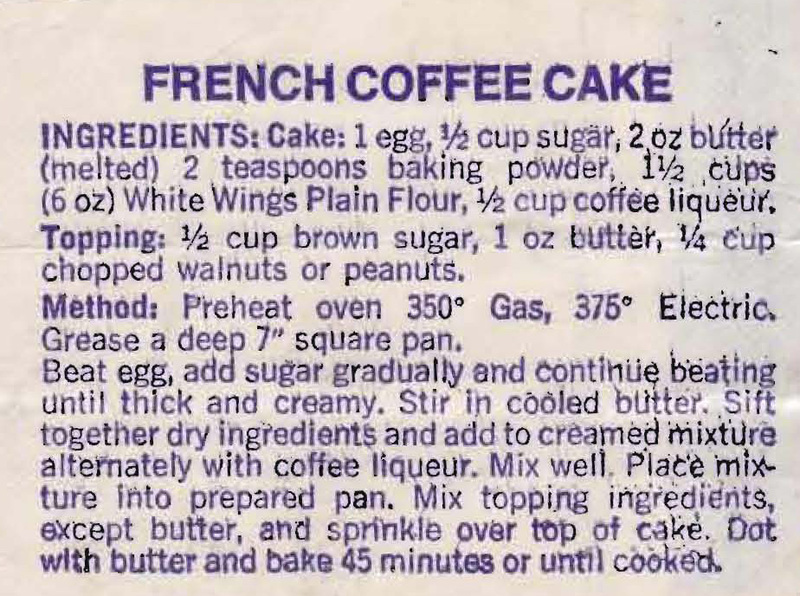 This entry was posted in All Recipes, Cakes and tagged 1970s, brown sugar, coffee liqueur, french coffee cake, plain flour, walnuts by bebsrecipes. Bookmark the permalink.